Les Eyzies de Taynac-Sirueil (known as Les Eyzies) is a pretty town in the Perigord Noir region of the Dordogne that is famous for its pre-history, grottes, caves and troglodyte dwellings. The pre-history site was discovered during construction for a railroad wernt through Les Eyzies in 1868, when a rock shelter in a limestone cliff was uncovered. Near the back of the shelter, an occupation floor was recognized, and when excavated, it revealed the remains of four adult skeletons, one infant, and some fragmentary bones. In and around Les Eyzies are a series of prehistoric rock dwellings, the caves include some of the most significant archaeological finds of the Upper Paleolithic (from about 40,000 to 10,000 years ago) and Middle Paleolithic (200,000 to 40,000 years ago) periods; they are especially noted for their extensive wall drawings. 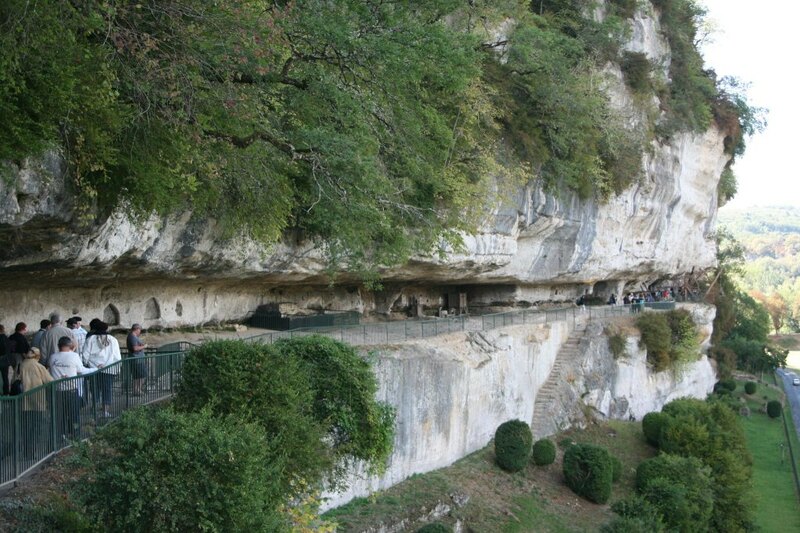 Situated in the Vézère Valley (the location of some 150 archaeological sites) the Les Eyzies caves are among a series of decorated grottoes in the area that were collectively designated a UNESCO World Heritage site in 1979. Les Eyzies was at one time a small hamlet tied to the Lordship of Tayac. During the VIIIth and IXth centuries it probably had quite an large population, as shown by the numerous troglodytic habitations and the presence of groups of buildings fortified against the Viking raiders. These can be found at the site of the museum, at the entrance to Les Eyzies, at the Roc de Tayac, Laugerie-Basse, at the Roc de Cazelles, at Les Girouteaux near Font-de-Gaume, as well as the troglodytic chapel of Guilhem. The cliffs are riddled with elevated look-out posts know as cluzeaux aeriens, artificial chambers cut out of the limestone cliffs so high one wonders how anyone ever got up there. In the 10th and 11th centuries the Lords of Tayac built a powerful fortress into the rock at Les Eyzies, which in 1322, passed into the hands of the Lords of Beynac. Tayac with its fortified church, all that remains of the XIIth century monastry, has retained much of its original importance. The Rock de Tayac, another The English at Tayac laid waste the Sarladais in 1408, but the French ousted them in 1411. During the Wars of Religion the Beynac family were protestant, but one, Jean Guy de Beynac-Tayac who retained his catholic faith and holding the chateau of Les Eyzies lay siege in 1590 to Saint-Cyprien. Having conspired against Henri IV in 1605 to avenge the beheading of his friend Biron, he was condemned to death, but, thanks to the intervention of Turenne, later pardoned. The chateau was finally abandoned in the 18th century. In 1913, the ruins were acquired by the State, which created there a National Museum of Prehistory. There are many things to see and do in Les Eyzies and the museum of pre-history is an excellent way to learn about pre-history man. The National Pre-Hostory Museum exists due to the driving force of teacher and excavator Denis Peyrony (1869-1954) the Chateau des Eyzies was acquired in 1913 by the state. The chateau was originally built on a prehistoric settlement and troglodytic village. From the chateau cave, dating from the Magdalenian, came a famous engraved bone representing a set of nine human figures near a bison. The buildings became the museum in 1923 and today houses over one million prehistoric objects. It is the most visited museum of prehistory in France. By the wealth of its collection. it comes second in the world, preceded only by the museum at St Germain-en-Laye. The museum is closed on Tuesdays. Caves and Grottes of Les Eyzies. There are many Caves and Grottes to be dicovered in Les Eyzies and the surrounding area. The most famous being Font du Guame on the outskirts of the town. Visit our Caves and Grottes page for all the details of things to see and do. The national prehistory museum brings together the biggest Palaeolithic collection in France and second largest in Europe and is one of the great things to see and do in the area. Dating from Palaeolithic to prehistory, visitors are offered a unique collection from prehistoric sites in the Vézère valley. The reception desk will be able to guide you to all the things to see and do at the museum. Free center for information and things to see and do at all prehistoric sites in the area. Bilingual staff to answer questions, such as hours of operation, maps to get there, times for tours. From the PIP there is a map that shows a prehistoric walking tour, one is 15 km and 5 hours and the shorter one is 8 km and 3 hours.The helpful staff at PIP will be able to guide you to all the things to see and do in the area. This museum features prehistoric relics dug up in the surrounding area. The site of Castel-Merle is also known as Vallon des Roches, This prehistoric site has the distinction of having its own museum where there are many artefacts from the various excavations of rock shelters. 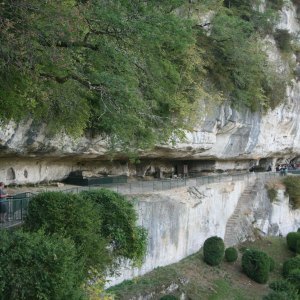 This is a great place to add to your list of things to see and do.These shelters were occupied successively by Neanderthals at l’Abri des Merveilles and at Blanchard II, then by Cro-Magnons, who mainly occupied the shelters located in the opposite cliffs of the Vallon des Roches, with more sunlight, as they face east and west instead of north. A 12th C Chateau in a valley where the Beune runs with pre-historic caves below. Read more about things to see and do at the Chateaux on our Chateaux page. Canoe the Vezere River which runs through Les Eyzies a must to add to your things to see and do list. 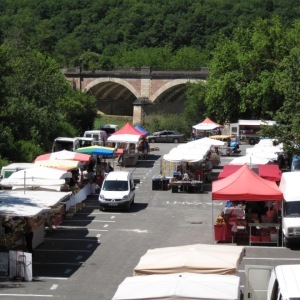 This trip takes you through a very rural France and past may pre-history sites and is a different experience to a canoe trip down the Dordogne river. 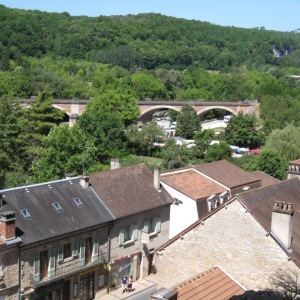 Canoes can be hired on either side of the river at the bridge that crosses the Vezere.